Mira Mesa finished the regular season on a roll and it appears they have not cooled off. The Marauders rolled to a 60-41 wire-to-wire win over Carlsbad in the first round of the Division I playoffs, extending their winning streak to nine games. The Marauders jumped out to a quick 7-0 lead and led 13-8 after the first quarter. Carlsbad trimmed the lead to one midway through the second, but Mira Mesa closed the quarter with a 7-1 run to take a 25-17 lead into the break. Mira Mesa had a clear size advantage over Carlsbad and exploited it from the beginning. Mira Mesa’s 6’8” Williams got easy looks close to the basket against a Lancers’ team that does not have a player taller than 6’3”. “Our gameplan was to try to pound it inside and if they doubled up, kick it out and try it again or shoot the outside shot,” said Mira Mesa head coach Dan Regas. Carlsbad battled back in the third quarter with pressure defense, narrowing the Mira Mesa lead to three with 2:00 left. But the Marauders answered with a 7-0 run, pushing their lead back to double digits at the end of the third. The Lancers closed the gap to five in the fourth before Mira Mesa found a hole in their press. The Marauders converted a number of wide open fast break layups in the final two minutes to win the game going away. Williams led all scorers with 24 points. Marcus Smith (12 points) and Kevin Ozier (11) also finished in double figures for eighth-seeded Mira Mesa (17-11). 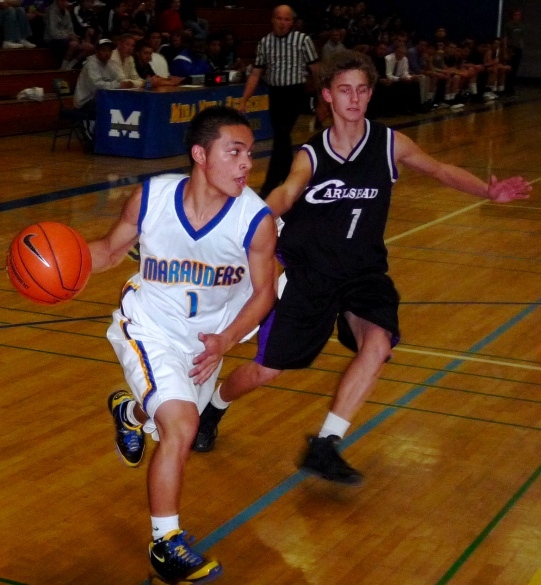 Guard Michael Tanael led ninth-seeded Carlsbad (16-13) with 15 points. After starting Eastern League play 2-2, Mira Mesa did not lose another league game en route to sharing the Eastern League title with Hoover. Despite that, Williams feels the Marauders still don’t get enough respect even in their own league. Mira Mesa’s reward for Wednesday’s first round win is a quarterfinal date against top-seed and section No. 1 El Camino (27-3) on Saturday night. The Wildcats have not lost in more than month and are undefeated at home.